 Lancaster, Pa., 2016-Apr-14 — /EPR Retail News/ — What’s better than a free pretzel for National Pretzel Day? The mouthwatering prospect of having free pretzels for an entire year, of course! 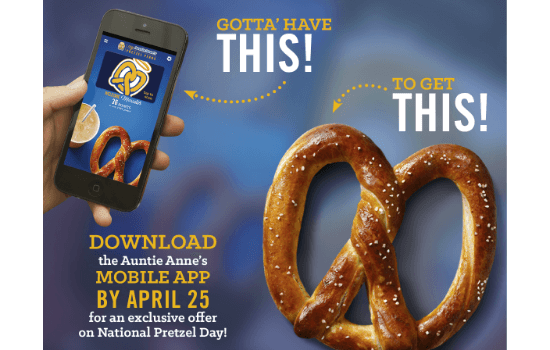 In celebration of National Pretzel Day, Auntie Anne’s® – the world’s largest soft pretzel franchise – is offering guests who sign up for the brand’s “My Pretzel Perks” app the choice of one free Original or Cinnamon Sugar Pretzel, redeemable on National Pretzel Day, Tuesday, April 26, 2016, through Sunday, May 1, 2016. Elevating the excitement, Auntie Anne’s today announced that five lucky app users will also be selected at random to receive free pretzels for a year! The winners of this pretzel perfect prize will be announced on National Pretzel Day. Pretzel fans who have not yet joined the ranks of the nearly one million “My Pretzel Perks” app users are encouraged to do so before 11:59 p.m. EST on Monday, April 25, 2016 for their chance to win. The “My Pretzel Perks” app is available for download for free in the Apple App Store and the Android Google Play Store. Through the app, users earn 10 points for every $1 spent at any Auntie Anne’s location. The points can then be redeemed for free pretzels and signature Auntie Anne’s items. “My Pretzel Perks” loyalty members also receive free pretzels on their birthday and information about fresh, new products. Auntie Anne’s offers its hand-rolled soft pretzel in a variety of flavors including Original, Cinnamon Sugar, Pepperoni, Roasted Garlic & Parmesan, Sour Cream & Onion, and Sweet Almond. For guests on-the-go, Auntie Anne’s also offers a wide selection of portable menu items including Original, Cinnamon Sugar and Cheddar Stuffed Pretzel Nuggets. And for those who need a little something extra in between meals, Auntie Anne’s offers a number of heartier, “hold-you-over” options such as Pretzel Dogs and Mini Pretzel Dogs. With eight different dips and a variety of drinks to accompany each pretzel, the combinations of possibilities are endless. At its more than 1,500 locations around the world, Auntie Anne’s mixes, twists and bakes pretzels from scratch all day long in full view of guests. Auntie Anne’s can be found in malls, outlet centers, and Walmarts, as well as in non-traditional spaces including universities, airports, travel plazas, amusement parks, and military bases. In addition, it has extended the brand onto retailers’ shelves and also serves as a distributor for fundraising products. Available at select retailers nationwide, pretzel fans can enjoy Auntie Anne’s prepare-at-home products, from frozen Classic and Cinnamon Sugar Soft Pretzels and Pretzel Nuggets, to frozen Pretzel Dogs and Pretzel Pocket Sandwiches, to a versatile Pretzel Baking Kit. For more information, visit www.auntieannes.com, or follow on Facebook, Twitter and Instagram. Atlanta-based FOCUS Brands Inc., through its affiliate brands, is the franchisor and operator of more than 5,000 ice cream shoppes, bakeries, restaurants and cafes in the United States, the District of Columbia, Puerto Rico and 60 foreign countries under the brand names Carvel®, Cinnabon®, Schlotzsky’s®, Moe’s Southwest Grill®, Auntie Anne’s® and McAlister’s Deli®, as well as Seattle’s Best Coffee® on certain military bases and in certain international markets. Please visit www.focusbrands.com to learn more. This entry was posted in Food & Beverage, Marketing, Retail, Retailer and tagged Auntie Anne's, Heather Neary, National Pretzel Day, pretzels. Bookmark the permalink.